What is Dad's Nine By Noon Magic Kingdom Challenge? Good question. 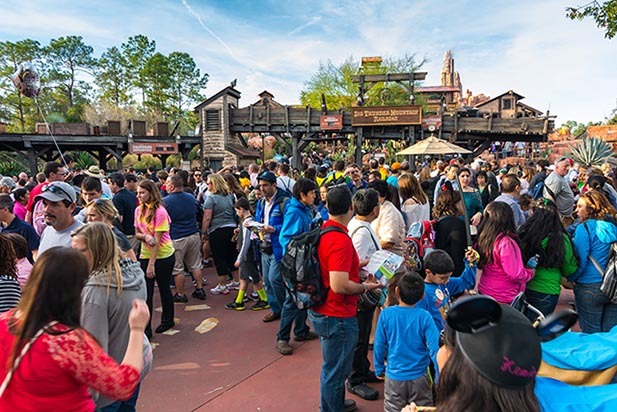 In December 2010, the New York Times had a story that said that “according to Disney research, the average Magic Kingdom visitor has had time for only nine rides – out of more than 40 – because of lengthy waits and crowded walkways and restaurants”. See the full story here. While I agree with a lot of the story, I vehemently disagree with the reason people only complete one fourth of the rides in the park. The story says, guests only complete 9 rides because of the long lines and busy restaurants. Bunk. That’s just crazy talk. In Dad’s experience, the reason most people only see nine rides at the Magic Kingdom in a day is because of poor or no planning. Yes, lines are long and restaurants are busy (if you arrive at noon, if try to go to Cinderella’s Royal Table without an Advanced Dining Reservation, if you try to ride the Mountains without a FASTPASS) but with a little preparation and thought any family should be able to accomplish more than 9 rides. So, Dad what’s this Nine By Noon Thing? When I first read the New York Times story, my immediate reaction was, I can do nine rides at the Magic Kingdom by noon. (I think I actually said breakfast, but that’s pushing it a bit.) Yes, nine by noon! Come on Mrs. Mom, we can do this. What do you think? Can you do it? Have you ever done the Nine By Noon Challenge? If so, tell us how you did it below in the comments. Mine train be brave , ride during the fireworks lowest wait times and so beautiful. We always head to the left, towards jungle cruise. Letting the throngs go towards anna & elsa Meet and greet and the seven dwarfs. Never have we had more than twenty people waiting at the second rope with us at adventureland. We scheduled two fast passes for the am, usually one ending about 11:30, the other starting as close to that as we can. Make reservations at the Plaza for noonish. The third fast pass starts during lunchtime. We wait til 11:30 to get on FP#1, go straight to FP#2, lunch and FP#3 afterwards. 3 rides and a long sit down lunch in less than two hours. My Stepmom read a book on how to see Disney before we went back in the late '80s. Of all the things she read about, only one stuck with me. Get to the park before it opens goes along with what you say and feels like a given, but as soon as they drop the rope and let you go...go to the left. The book said most people's tendency is to go right towards Space Mountain. I've been going left ever since. You can ride Jungle Cruise, Pirates of the Caribbean, Splash and Thunder Mountains in the time it takes you to run through the lines and ride the rides. You're almost halfway to 9 and you're 30 mins in. It's a sma11 (Disney)world after all! Loved this challenge ! We went all in for this challenge and started our day by taking advantage of extra magic hours. We knew we had 2 fast passes before noon. We arrived at the park at 755 and headed to Fantasy Land. We were the first guest on Journey of the Little Mermaid. Then went to Goofy's Barnstormer which we rode twice but only counted once. Headed to Dumbo and then The Many Adventures of Winnie the Pooh. We had to head towards Frontier Land so we did Small World and Pirates of the Caribbean. We then used our fast pass for Splash Mountain and scooted over to Big Thunder Mountain. We were under the gun because we had reservations at Be Our Guest at 10:30. Before lunch we had time to sneak in Swiss Family Robinson Treehouse. Therefore, completing 9 before 10:30. After lunch we had time for 2 more. We used our fast pass for Peter Pan and then got on the Carousel of Progress. So we completed 11 rides before noon. This was so much fun!!! We went the last week of Feb, and the crowds were more than we expected them to be. We went to am extra magic hours and went straight to Mine train, 20 minute wait! Then, we got Tomorrowland speedway. From there, we rode Dumbo twice with no wait either time. We then rode It's a Small World, Mickey's Philharmagic. We then had fast passes for Peter Pan and Winnie the pooh. Then we got the Haunted Mansion with a 15 minute wait! We got this all by 1215. I was pretty pleased with that morning!! How about 12 by 12? It was easy. We did it on August 1st 2016. We arrived when the park opened at 8am. Here's how we did it. By noon the park was miserably crowded so we didn't get as much done after that even though we stayed until midnight. 8. only short wait to Space Mnt. 10. went on to see Carousal of Progress. Then we had lunch right around noon, and hit other attractions.